iOS 6 Adoption Uptick Due to iPhone 5 Release in China, Not Google Maps? Ad network and analytics firm Chitika claims it has seen no significant increase in iOS 6 adoption in the U.S. and Canada. A company analyst believes the MoPub data (which was international, rather than domestic) we wrote about earlier today was affected by the recent launch of the iPhone 5 in China, rather than the release of Google Maps. This past weekend, Apple issued a press release bragging that it had sold more than two million iPhone 5 units in China over the first three days of availability. In the chart above -- which only looks at data from the U.S. and Canada, rather than the international data that MoPub examined -- the iOS 6 adoption slope following the release of Google Maps for iOS remains practically unchanged from before the release, suggesting a sea change in iOS 6 adoption rates resulting from Google Maps release is inaccurate. Thursday, December 20th marks the first full week of Google Maps' availability in the Apple App Store. 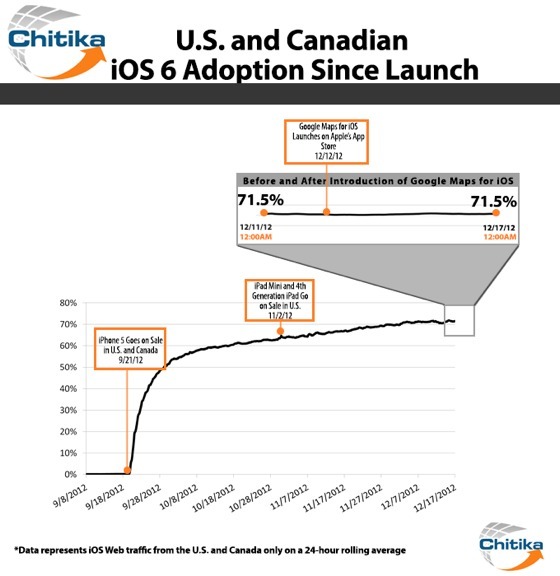 To determine the impact of Google Maps on iOS 6 adoption, Chitika Insights conducted a research study analyzing the trend in adoption rates since the applications' release, along with mapping the OS' adoption rates since its debut on September 19th, 2012 for added context. Following Google Maps' release, Chitika Insights observed iOS 6 usage remain fairly flat from midnight on December 13th to midnight on December 17th 2012. On Monday, Google reported that Google Maps for iOS had been downloaded more than 10 million times. Dear god Macrumors either get on the bandwagon or dont. "its because of Google maps"
"no wait, its because its Christmas"
"no...wait a second, its because of China." Here's a thought...maybe it's all three. I know of 2 people including CmdrThor and wife that delayed updating to iOS 6 due to the maps "issue". Why would Google Maps drive adoption iOS 6 adoption? It's a cluttered mess of a GUI on Android. They might have better map data than Apple but it's about damn time I, the end user, start seeing it instead of just reading about it. Show, not tell. Apple Maps has a far superior and easier to use GUI and has a significantly larger locations database than Google. Although it falls short in some areas, no GPS system is "perfect". Let's not forget that some people drove into oceans and off cliffs using the same map data provider that Google (and Apple) uses. Google maps wasn't that important :confused: it seems an exaggeration to me that anyone could hold off just based on that. If it was deadly vital you could just go to the mobile site. I have had zero issues with Apple Maps anyway, I downloaded the new Google Maps but its in a folder for emergencies with other apps like Waze. I was in London a few days ago and decided to give Google Maps a spin when I got lost, and it was giving me confusing directions. Switched to Apple Maps and it was much clearer. How is that for irony? that could bump ios 6 adoption rate. Used the google maps and iOS maps side by side on an andorid and iphone to go to a Verizon store. Google maps was 1.5miles longer and wanted us to do a U turn on a non-U turn spot. A friend of my was trying to show where her house was in Argentina. Her house was on a river according to Google maps. Iphone maps had, several restaurants we went to, close by but not at the same location as it supposed to be. Lastly, apple store location on google maps comes up as a panda express. I thought that was funny. I think approaching to Google maps like it is the god of maps is kind of silly. I would like to compare them 5 years from now. That would be fair. At the end of the day, there are 2 options iphone owners can use now. Out of the 7-10 people I know with iPhones, only one purposefully held back on iOS 5 because of maps. And she did so mainly because she relies big time on Transit Directions, which Apple Maps doesn't have at all.